This unusual surname is an interesting example of that sizeable group of early European surnames that were gradually created from the habitual use of nicknames. These nicknames were given with reference to variety of characteristics, such as physical attributes or peculiarities, mental and moral characteristics, or habits of dress and occupation. The derivation, in this instance, is from the Olde English pre 7th century "leoht", nimble, quick, with "fot", foot, originally denoting someone with a light, springy step; a speedy runner, or messenger. Early examples of the surname include; William Lightfote (Cambridgeshire, 1273), and Willelmus Lightfote (Yorkshire, 1379). In the Norfolk "Towneley Plays of Caesar Augustus", dated 1274, reference is made to the characters "Lyghtefote Nuncius" and "John Litefot, cacher". John Lightfoote, an early settler in America, was recorded on a Census of those resident in Virginia in 1624. A notable bearer of the name was Joseph Barber Lightfoot, chaplain to Queen Victoria (1862), and bishop of Durham (1879 - 1889). 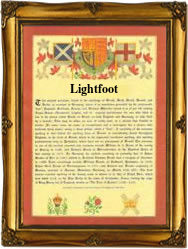 A Coat of Arms granted to the Lightfoot family is a barry of six gold and red, on a bend sable, three escallops argent. The Bend or shoulder strap signifies Defence and Protection, and the Escallop or pilgrim badge symbolises Venture to foreign lands. The first recorded spelling of the family name is shown to be that of Hugh Lihtfott, which was dated 1206, in the "Curia Regis Rolls of Lincolnshire", during the reign of King John, known as "Lackland", 1199 - 1216. Surnames became necessary when governments introduced personal taxation. In England this was known as Poll Tax. Throughout the centuries, surnames in every country have continued to "develop" often leading to astonishing variants of the original spelling.